Those of you that really know me, know I am very forgetful. I get going in one direction and then get carried away and leave what I was doing behind. I call it advanced adult onset quilt ADD. I think they should do a case study at a quilt retreat because I know I'm not the only one. I did get caught up on my google reader last week but sadly my email is bulging. If you asked me a question and I didn't answer, please email me again. Sorry about that. 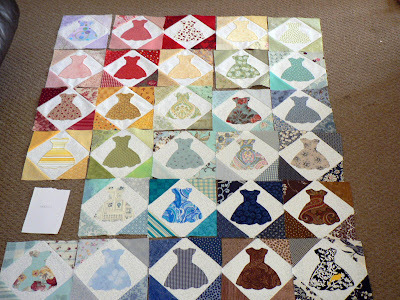 The very sweet Karen sent me pictures of her dress quilt that she is making and I was going to post the incredible pictures a couple weeks ago. And then I didn't flag the email and I forgot about it. Typical me. Karen designed the lay out of the dresses and block corners in a color wave. I absolutely love it. Look at the flair this black and white dress has. It is super cute. Karen has done such a wonderful job. Thanks for the photos Karen. The quilt is looking fabulous. 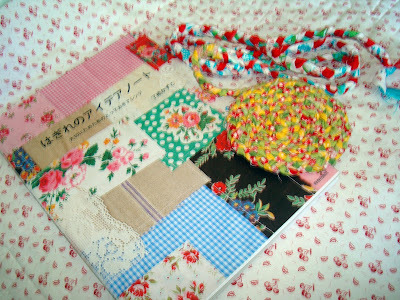 Since getting my latest 2 Japanese quilt books I've been enjoying looking at all the pretty photos and fun projects represented in the pages and dreaming of making every single thing. This braided hot pad is so inviting. 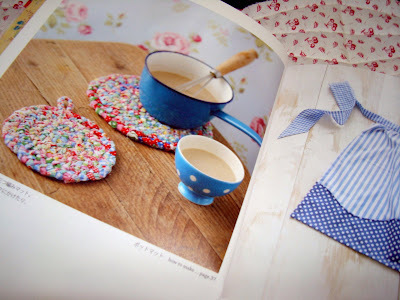 And looks so easy and fun to make. Do I have time to squeeze in a new project? Probably not. Oh well. Of course I can't read the instructions in the book but the diagram is pretty clear. So I cut 1" strips of fabric and folded them in half. I think the instructions call for folding in the rough edges but I wanted to make it quick and raw first to see how it would work out. 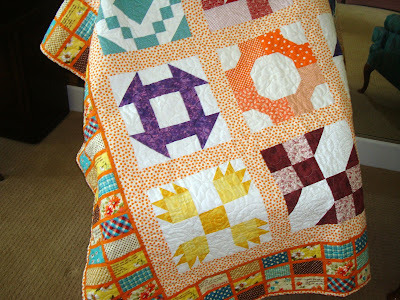 The pattern really calls for making the braid with short strips of fabric in patchwork style. So I might try that for my next one. First I used yellow green and red to start. 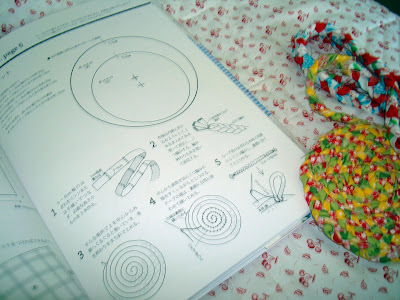 Then I sewed on different colors to enlarge the circle. Now I'll stitch them together and see how I like it. The green, red and yellow kind of look too muddled but it is ok for a first attempt. However, I'm still tied to my machine. "V" asked what machine I quilt and sew with. I have several machines but this is the one above I use the most. I think it is about 19 years old. The last of the metal Berninas pretty much. 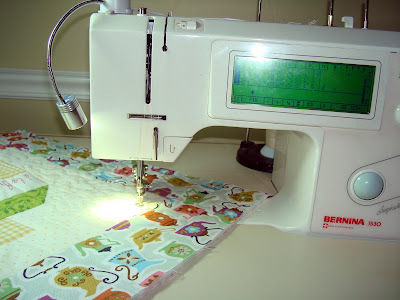 And that handy little light my sister bought me in St. George is perfect, especially for machine quilting. I have a floor light that is pointed above my machine but doesn't give me the spot control needed and can create shadows. This little light with the movable neck gives me the control my 52 year old eyes really need. 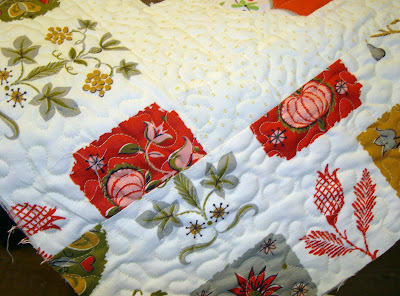 I am really excited to see Lori Holt tonight and hear her speak to our Alpine Quilt Group. I'm finally going to meet Lori! Yipee. I promise to take lots of pictures that I'll post probably Thursday. If you haven't gone to Lori's blog to see her work, do so today! And Lori is having a giveaway this week. I am weak in the knees about it. I have mixed feelings about telling you to enter. Cuz I want to win! I also have to tell you about 2 of my blog friends and real life friends Kim and Nedra having giveaways on their blogs, too. Kim is on Moda Bakeshop this week and Nedra is showcasing a bag made from my pattern. 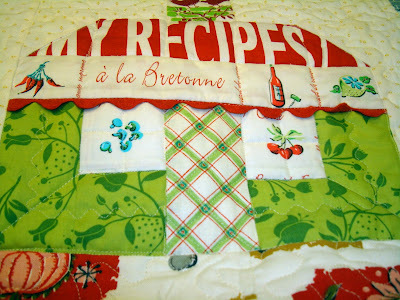 Go check out my friends and then come back here later in the week to see Lori's quilts. 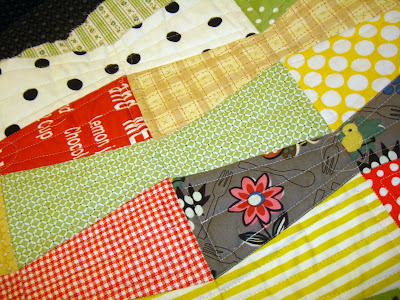 Most every moment spent at my machine this past weekend was spent quilting. I know the reason I will never want a specialized quilting machine. I only like machine quilting in small doses. Lucky for me TCM was having an Alfred Hitchcock weekend. I don't quite know why but I seem to always overdo everything. (e.g. 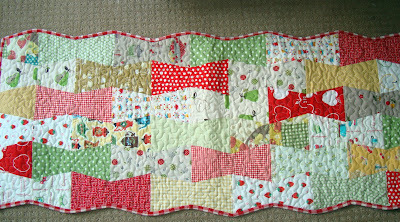 8 children) One of the 8 table runners I am making is 82"x23". What was I thinking? 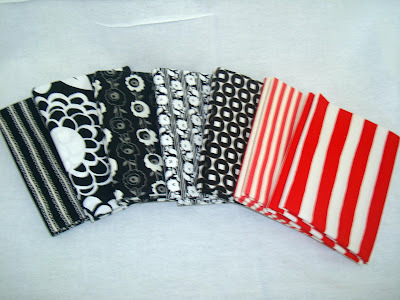 Who has a table that accommodates a table runner of that size? And who tries to make 8 table runners in a couple weeks? 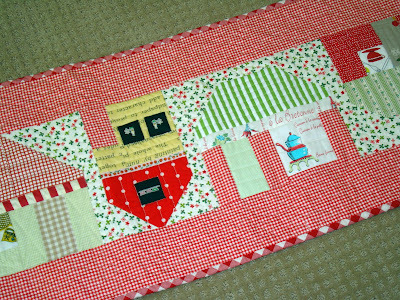 And then I proceeded to micro quilt the cottages in the biggest runner. This cottage above has quilting following the lines of the roof and the brick. I think I spent 3 hours total quilting the big runner on Saturday. 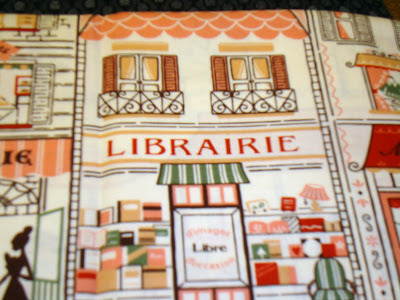 I fussy cut some of that Paris street fabric that I showed on Friday for the upstairs window. 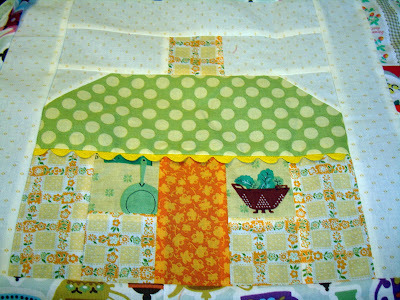 The 2nd house in that runner has less quilting though. And so on. But still I know I still went way overboard. 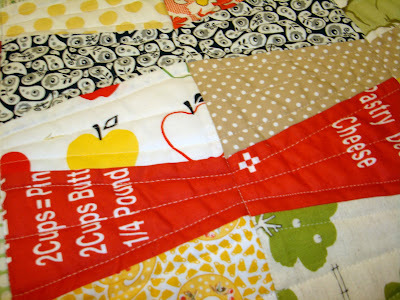 Once you start quilting there is no stopping until the project is finished. This cottage has the least quilting. 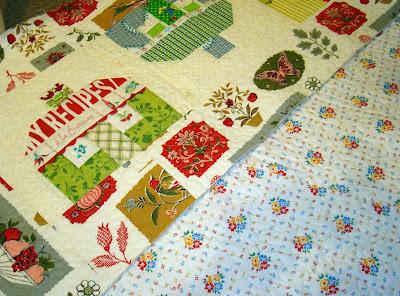 With 2 more cottage runners to quilt (out of the 8) I will not make that mistake again. Less is more, isn't it? There is no way I can even take a photo of the whole thing. It is just too long. I stippled the outside border parts of this runner. 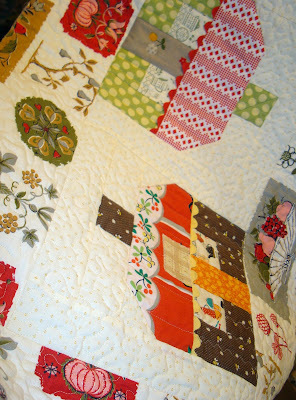 I used vintage home dec kitchen fabric to border it that I have had for many years. 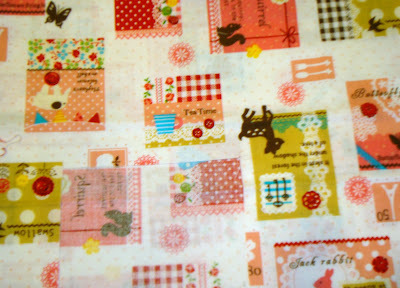 I still have tons left of the border fabric. 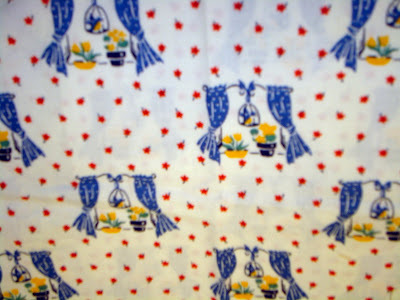 I liked using fabric on hand and the vintage home dec fabric gives it a table cloth look. The tumblers were so much easier to machine quilt and took far less time. 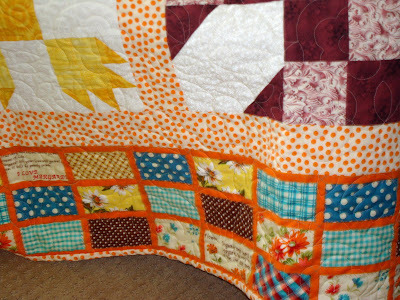 I quilted bows into the tumbler bow pattern of the runner. I don't know if you can tell from this photo. 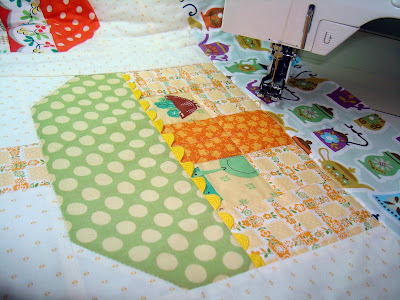 I simplified the quilting on the other tumbler runner. Hey. I have a deadline! I was going to try some new machine quilting techniques using blue painters tape. But after a 7 foot table runner I had to set that idea aside. Gotta run. My machine is calling me. I'll be quilting. And when that is over I'll be binding. 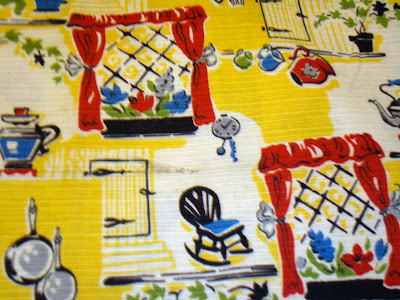 I really like vintage fabric featuring windows and curtains. 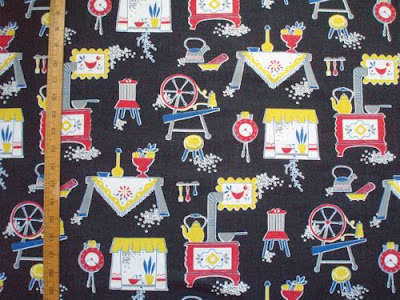 I have a tiny collection of windows fabric I thought I would show you today. Yayy Friday. 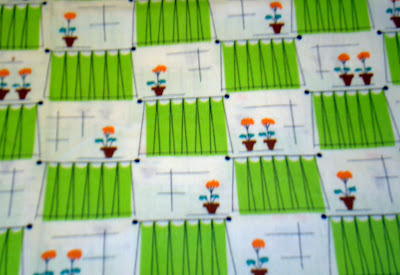 This is one of my favorites showing curtains on a cute rod, the hint of a window with the intersecting lines and then the geranium in the window. It is clever and sweet and the colors are lovely. This is a feed sack showing shutters and again a flower pot on the windowsill. It is really a simple print but has such personality. 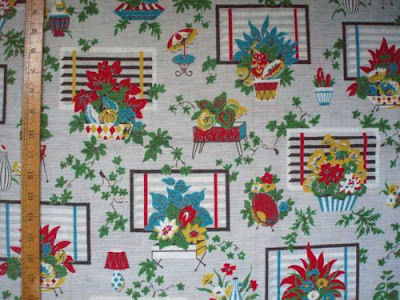 This fabric is vintage 50s, I'm pretty sure. Not only does it show a cute window scene but lots of other kitchen vignettes. Adorable isn' t it. I hate to cut it. This is a Japanese print with little squares that I think some of could be windows and curtains. The square with "Tea Time" and the cup looks like a window to me anyway. Isn't this one sweet in gray, green and pink. These windows show shadows of the people living beyond them. I'm sure this one is familiar to you as a reproduction from several years ago. More curtains with flowers in the window. 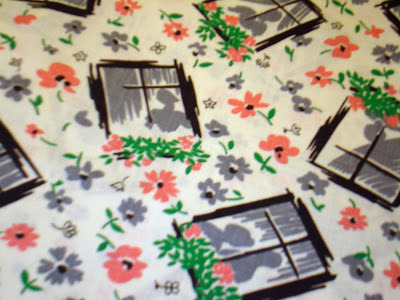 I wish I had a window fabric with a pie on the windowsill. Wouldn't that be cute. 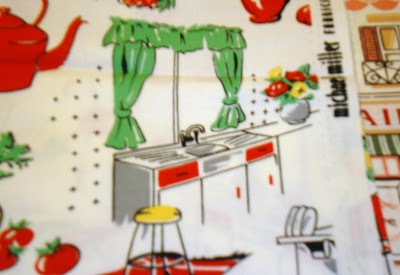 You'll probably recognize this Michael Miller reproduction fabric with the classic 50's kitchen sink/window combination. This one is a Japanese fabric with street scenes that I'll probably fussy cut this all up instead of using it as one piece. Here is another shot of the little Paris street. 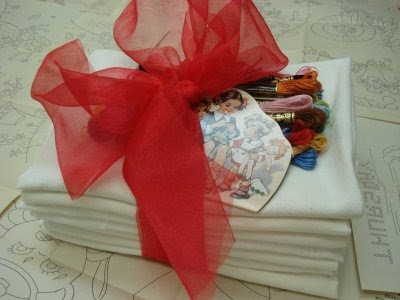 It is really charming but I don't have enough of it to really use it for more than fussy cutting. Another Japanese print that isn't window scenes but I see this as snippets of home life that when fussy cut and put into a window on a cottage will appear as if you are looking into the lives of the family living there. This is not my fabric but fabric I would love to have it. It is vintage from the 50's but too pricey for me. I love the "wallpaper" around the windows. More fabric I wish I had. Not only does it have darling windows but look at all the kitchen items, particularly the table and kettle. Lovely isn't it. Again, too pricey for me but I'll keep looking around for deals on fabric to add to my collection featuring windows. Ah the cottages I could make . . . 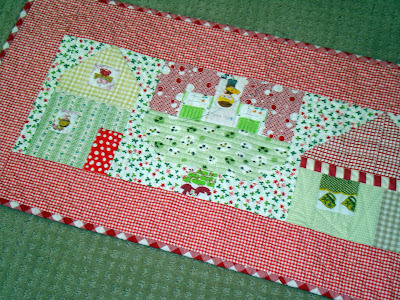 I've been sewing table runners and really enjoying making more cottages and little houses to star in them. The cottages and doll houses are addicting because I can dress each one to be unique and be a builder of fabric houses. 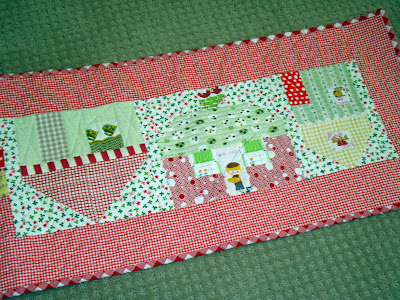 Above is a quilted and completed table runner in red, green and yellow. 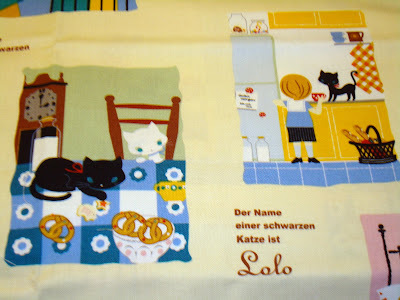 It is hard to get a photo of the entire length of a table runner all in one shot. So I'll show the runners in chunks. These table runners are going on vacation with me in 2 weeks. I wonder why?? 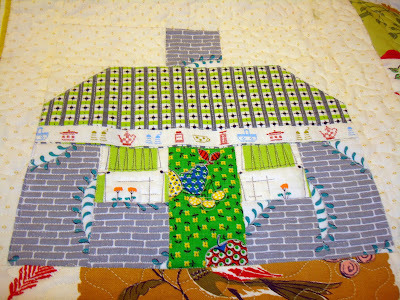 I quilted it myself to enhance the architecture of each little cottage. It was fun but it took forever. I think I got it this one too long though. We'll see how it works out. And I made another one. 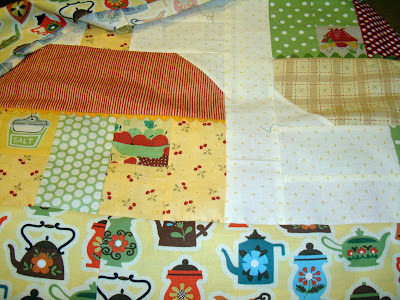 This one is in green and yellow with the Blank Quilting border in a frosty green. 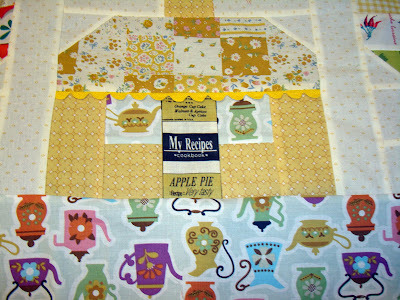 It isn't quilted yet but I hope to take care of that this weekend. 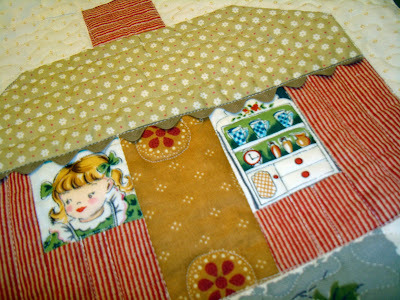 I really like sewing the rick rack like this after seeing Diane put rick rack in her pot holder. It totally finishes the cottages off. 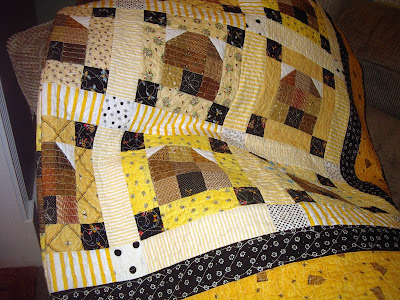 I used the yellow back ground of the same Blank Quilting fabric (thanks Janean!) to make yet another cottage runner. 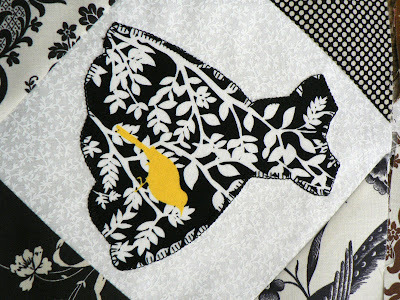 Both color ways of the border fabric are a perfect finishing touch. 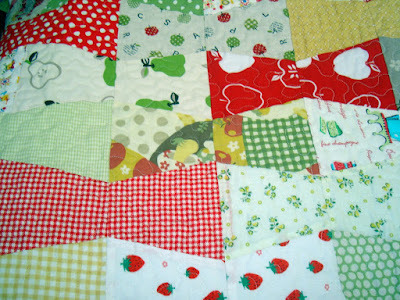 More quilting to do this weekend. I know there are a lot of these pictures but I couldn't stop making the cottages! I am almost out of that orange fabric that the roof is made out of on the left. It is vintage and I've used it and reused it for the past 5 years. I wish I could get more of it. 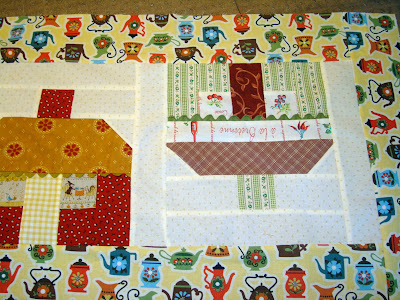 I also used my Tumbler Bows baby quilt pattern to make a table runner with a different theme. You can't make too many runners ya know. I still want to make a couple more toppers/runner. We'll see how much time I have and how much I get quilted Saturday. I'm not through yet! Stick with me a little longer for a big treat post. You've got to visit Sarah and see her beautiful cottage quilt and play by play of her visit with the famous and lovely Monica. Both Sarah and Monica are so incredibly talented. I really enjoy reading both of their blogs and getting to know them. It was surprising to me to read several blogs this week and see so many of us meeting with each other in the real world. I just wish I could have been along with each little meeting. I can't wait to read Sarah's next installment of her visit in Monicaland. Last fall when my daughters and I were discussing starting a blog and what to call it, it seemed perfect to name it after my mother, Freda. Our home is always a buzz of excitement and confusion with people coming and going, cars in the driveway and happenings both good and bad everyday. So it seemed natural to call our home a hive. 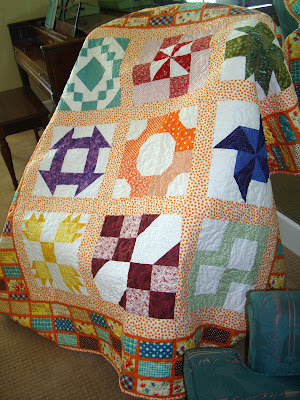 This quilt is one of my first original creations and I came up with the idea for this quilt in the middle of the night. 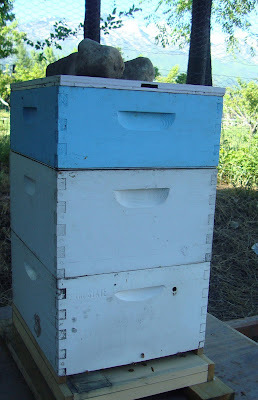 I have always thought a hive was a beautiful image and since I was a young girl I have always liked bees and beehives. My grandfather and uncles were bee keepers the little town of Huntington, Utah where my mother grew up. However, when we named our blog I never dreamed we would have a real live beehive in our back yard! A couple weeks ago Shelbie posted about the beehive and chickens on our little farm. Well the hive is so amazing. It is so incredible to watch bees in our yard and how they act as they go in and out of the hive. It is inspiring to watch their little community and how they work together to make something so lovely like honey. 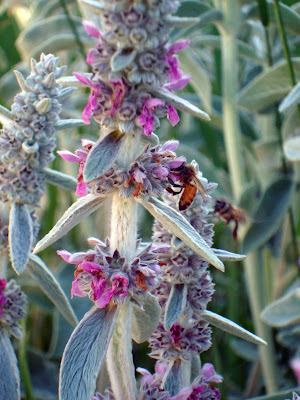 The bees LOVE our lambs ear in the front yard. When you walk up to my front door the sound of buzzing is everywhere. We have lots of big mature trees around our home. When we built our home 15 years ago planting trees was one of the first thing we did and I insisted on planting what some might call a trash tree that grew up anywhere and everywhere in Pennsylvania, where I am from, so a few of our trees are Sumac trees. I had to have them. Our yard is kind of overgrown and to me it looks like a Pennsylvania yard, especially with all the rain we've had here this spring. 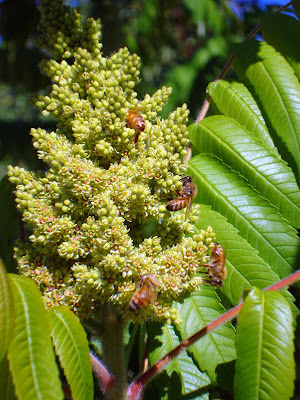 The sumac pods currently on the trees are alive with bees! The bees love those sumac flowers. I don't know what kind of honey sumac will make but the bees are all over these them and are extremely busy going back and forth to the hive from the sumac and the lambs ear. This little video shows how determined and how active the bees are in our back yard hive. Maybe this isn't amazing to you but it is just so incredible to me to see the nature of a hive and bees. Isn't nature amazing. 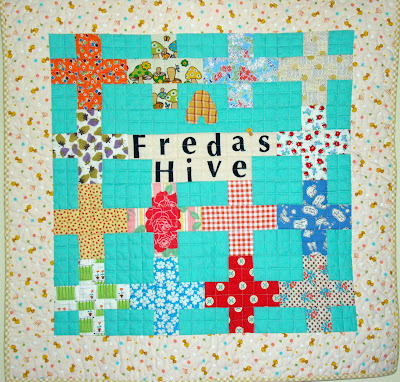 I am so glad we called our blog Freda's Hive. I am grateful for my bee heritage and the worth of work that my mother taught to me and my sisters. Lets just hope I can pass a small measure of that ethic forward. 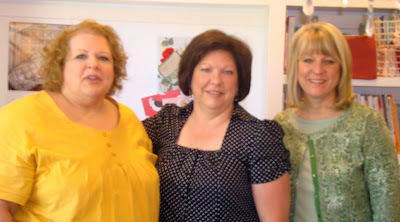 Friday I got a visit from Kim and Nedra - both very dear friends. We chatted and had a sweet time together talking quilts and life. Nedra came bearing gifts. These needles are from Superior Thread. They are titanium needles and Kim and I were both really happy to get them. Nedra is an educator for Superior Thread and it was exciting to hear her plans. The needles are on top of fabric. But staged this way it makes the fabric look like packets of seeds or labels. They all look like pieces on top of each other. 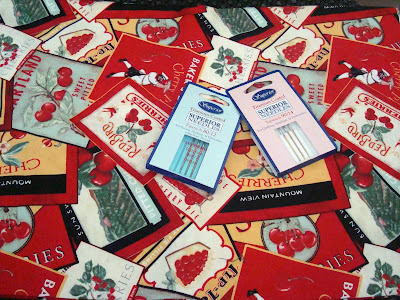 But no, the red cherry stuff is fabric. Cute huh. Fussy cutting for the future. Thanks Nedra. I showed them my finished quilt from Jane's Rainbow Swap. It is back from the quilter and all bound now. No label yet. But that is coming. Really. I haven't washed it yet either. But I'm very happy with it. My kids were surprised to see me with a more traditional quilt and I had to explain to them that I only made one of the 9 blocks. The border is cheater fabric. Nedra and Kim had thought I pieced it. NO WAY. 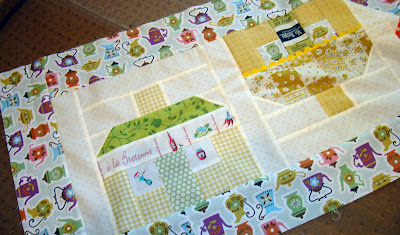 I finished my swap blocks for Jane's Halloween Swap, complete with Freda's Hive label on the front of the Halloween Cottages. All that is left is a trip to the post office. I wanted to get them done before I go on vacation. I had plans to try to get some shop hopping done but it just didn't happen. 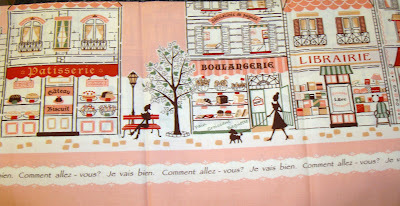 For really great reports and pictures of shop hop see Kim and Nedra's blogs. Kim even had a giveaway. They were troopers and went to most of the 15+ stores. I'm so pitifully behind on things (like email and blog hopping) that I couldn't begin to think about shopping. But! I did get to Broadbent's. It was fun to see my friends that work there dressed up and in vintage hats. 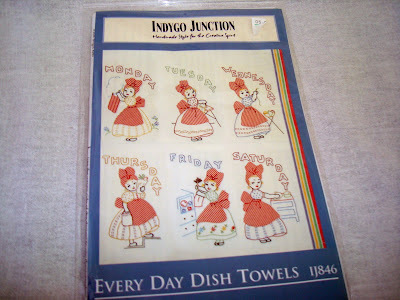 They were an "antique store" complete with antique quilt displays and 20% off the reproduction fabrics. 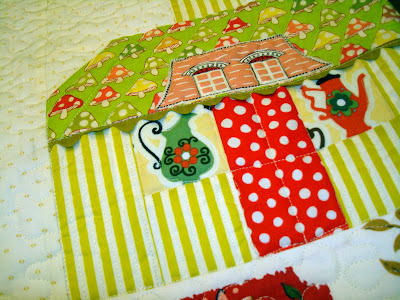 Flora has a new quilt displayed inspired from Fiesta Ware colors that is absolutely a knock out. 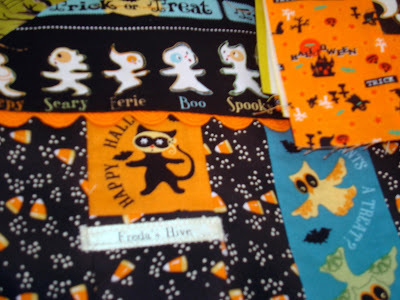 And their Shop Hop Quilt was amazing. 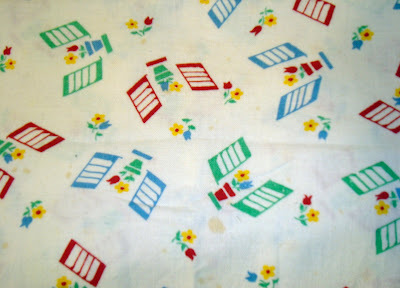 I got this pattern above to make dish towels while I'm on vacation in a couple weeks. 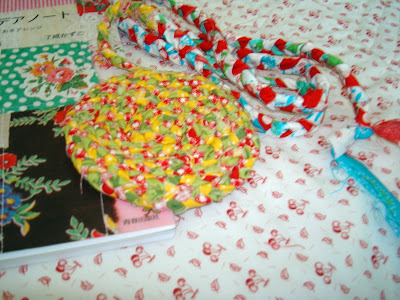 I also got some fat quarters for 2 projects. Heaven knows when I'll get to them but they are on my list! I had also been meaning to get these perfect circle templates. 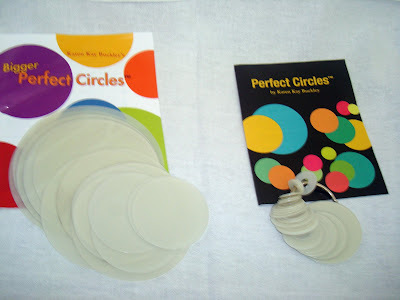 I am excited to have them as they would have come in handy on many past projects so I know I'll use them the next time I need a circle. I am very organized with posts for the week. I have my photos all loaded on Blogger for the coming week. So I feel like I'm ahead of the game in that department. Lets see if I can get caught up on what many of you are doing and get to my overloaded in-box.